I have been enthusiastically in love with horses as long as I can remember. I lived vicariously through my friends that had horses, but did not have any of my own until the age of 35 when my husband found me three beautiful older Arabian mares to care for. We brought them home to our small 5-acre farm near Carlton, Texas, where my dream began to take shape. I had always dreamed that when I grew up and got a job it would be with horses. Of course, as these things usually work out, my life went in a completely different direction. I ended up in the world of computers because of my strong typing and technical skills. I spent many years in IT and web design, eventually working my way up the corporate ladder into middle management as the Purchasing Manager for a large corporation. While the income was nice, I found the office politics and daily stress of my job completely unfulfilling. I wanted a more rewarding career than my corporate job could provide and felt that through equine massage I could achieve my goal of helping and working with horses. So I put my experience as a web designer and tech savvy to work at night and on weekends. I set out starting my own company doing web design, as well as doing some photography and videography at local natural horsemanship clinics to help fund my education. In early Spring of 2006 I began studying with the Northwest School of Animal Massage whose program I found to be very thorough with lots of opportunity for continuing education and it fit into my existing life of having to work full-time and care for my family. However, after completing the program I still felt there were some missing pieces to my education and I craved something more in the way of WHY did things happen to horse's bodies. What were the underlying reasons that some horses would continually have the same problem crop up over and over even after multiple sessions with chiropractors and other bodyworkers? 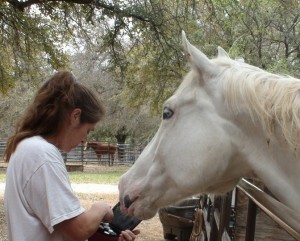 I finally found the answers I was looking for In February 2007, when I traveled to Arizona to study with internationally-recognized equine bodyworker and Certified Equine Massage Therapist, Dino Fretterd, through Advanced Whole Horse Dynamics (now known as Advanced Whole Horse Dentistry). Here I was able to study with other equine healthcare professionals (farriers, equine dentists, and veterinarians) in treating the horse as a WHOLE on a working dude ranch with access to many different horses. 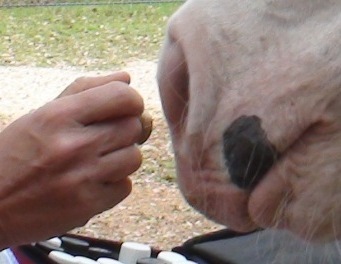 I learned to look at the horse from a completely different perspective and how each of the different aspects of the horse's body (feet, teeth, musculoskeletal system) affect one another and the importance of teamwork within the equine healthcare community and horse industry. I believe I have become much more effective in what I do because I have learned to recognize when the horse needs help in other areas of the body before it can achieve a balanced state. I have had the pleasure to observe and learn from several other notable Texas bodyworkers like Dr. Paul Bruton, DVM, of Animal Healthcare of Southlake, in Southlake, Texas, whose use of acupuncture, soft tissue manipulation and chiropractic has changed the lives of many a horse, including my own. In 2006, I was privileged to attend a beginners FLOW course with Dr. Lance Wright, DC, of Aubrey, Texas, and was fascinated with his wonderful new touch therapy Flowtrition. Most recently I have found the final missing piece to my horse puzzle with Young Living Essential Oils! I've found these natural products to be invaluable, both in my work as an equine massage therapist and at home for my family and pets. I'm always looking for safe and natural remedies to incorporate into my stable management and pass those tips on to my clients. I'm continuously amazed at the new and unique ways I'm finding to use these products in my every day life. I've not been disappointed yet! 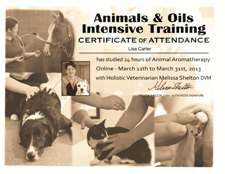 At the beginning of 2013 I was fortunate enough to be able to attend Dr. Melissa Shelton's Animals & Oils Intenstive Training for Animal Aromatherapy and plan on continuing my education with her. 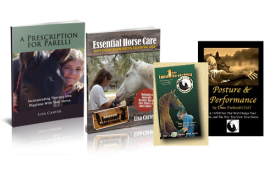 I am also an avid student of Parelli Natural Horsemanship and have been studying and utilizing this wonderful program with my horses since the summer of 2004. I am currently studying Level 3 of that program with my 2008 Polish Arabian mare Siofhice (pictured above) whom I foaled out myself and has been raised completely within the Parelli program. I have found that applying the principals of natural horsemanship when establishing contact with my equine clients can aide in quickly gaining their trust, respect, and relaxation to my touch. By being able to read and understand the subtle body language of the horse and making adjustments to my own body language and touch as necessary, I can increase the effectiveness of my massage sessions. 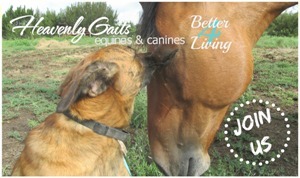 I'm looking forward to finding and sharing new natural ways to serve my four-legged friends! Many Blessings to your healthy and happy horse!